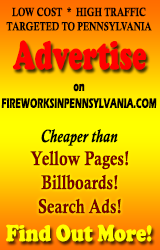 I’m Meg Geddes (netmeg), and FireworksInPennsylvania.com is my baby. Well, one of them. I’ve always loved fireworks; from sparklers to big community boomers. I grew up with fireworks in Ann Arbor at Buhr Park, and then city airport, but at some point, we stopped having them. I don’t even remember why – I think maybe it was more the logistics than the money. Nobody wanted to deal with the hassles of traffic and cleanup. Anyway, every year I’d be searching out where the closest fireworks were, and it got to the point where the people who knew of my interest would email or call, and from there it was a short hop to just putting up a quick and dirty web page to refer them to. The first version of this site was called detroitfireworks.com and included two listings – the big fireworks in Detroit, and the Ford Lake fireworks in Ypsilanti. Here’s an ancient version of it – it’s not the oldest one that exists, but it’s probably the oldest one that will actually load. So after a while, people would not only ask me about the fireworks, but actually send me their local listings and ask if I’d put them up too. So with the help of my friend Lee Payne, who has a lot more database and coding skills than I will ever have, we expanded the site. After a few years, we had a couple hundred displays, then 400, then 500. And people bookmarked it, and emailed it to their friends, and posted events on Facebook, and well, here we are today. Presumably you’re here because you like the *boom* too. I hope you find what you’re looking for, and if you don’t, I’d like to hear about it. I’m always up for feedback and constructive criticism.